The year is 1817, and Florida is on the brink of war. A young woman stands on the deck of a flatboat, anxiously watching the banks of the Apalachicola River. Not far away stands a Seminole warrior, eyeing the vessel from behind his concealment, choosing his targets carefully. Neither the woman nor the warrior can imagine how much their worlds are about to change. Inspired by the true story of Elizabeth Stuart, a young army wife taken captive by the Seminole during the Scott Massacre of 1817, Elizabeth’s War takes the reader through the clash of empires that became known as the First Seminole War. The war is seen not only through Elizabeth’s eyes, but those of her Indian captors, and of her husband and father, who are part of an avenging army bent on destroying the Seminole people. To stay alive among the Indians, Elizabeth will have to fight for her life, hoping she can survive long enough for Andrew Jackson’s army to rescue her. 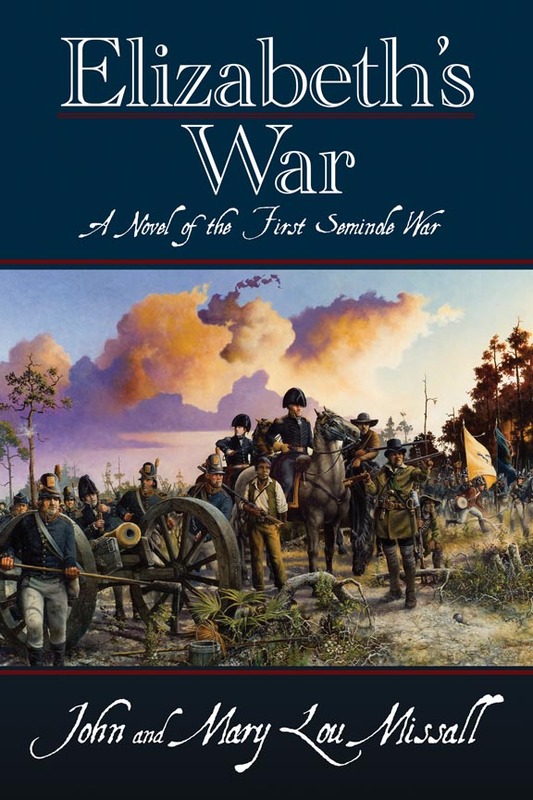 Written by Seminole War historians, Elizabeth’s War is a prequel to Hollow Victory, winner of the 2012 Patrick D. Smith Award for Fiction from the Florida Historical Society. Based on years of research into the Scott Massacre, Elizabeth’s War concludes with a detailed history of the event and an overview of the First Seminole War. John and Mary Lou Missall are authors of The Seminole Wars: America’s longest Indian Conflict, and Hollow Victory: A Novel of the Second Seminole War. They are editors of This Miserable Pride of a Soldier: The Letters and Journals of Col. William S. Foster in the Second Seminole War and This Torn Land: Poetry of the Second Seminole War. They are also editors-in-chief of the State of Florida’s Seminole Wars Heritage Trail Guide.